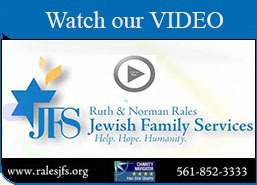 Danielle N. Hartman joined Ruth & Norman Rales Jewish Family Services (JFS) as President and CEO in March 2010. Under her leadership, the operating budget at JFS has more than doubled from $3.4M to $14M and their Endowment Funds have increased from $6M to $11M. She has significantly diversified their funding base; the staff has more than doubled; and partnerships have been built with several community organizations including several Florida Atlantic University (FAU) colleges. Danielle received her M.S. in Nonprofit Management from FAU in 2010 and her B.S. in Marketing with a specialization in International Business from Drexel University in 1993. Danielle was recognized as the FAU Distinguished Alumna for the College of and Design and Social Inquiry in 2017. She is a graduate of the Jim Moran Institute for Global Entrepreneurship (2017). Before deciding to work in the nonprofit sector, Danielle spent seven years in the private sector as a Manager of Operations for GE Supply, a division of General Electric. She has since taken on numerous roles, which, aside from JFS, include the Board of Advisors for the FAU School of Social Work and the Palm Beach County Hungry Relief Advisory Committee (Since 2018). She is a past Board Member of the National Association of Jewish Human Service Agencies (NJHSA). Beth Levine started her career at JFS in 1992 as a part-time financial assistance processor. Less than one year later the position became full time and she took on the additional responsibility of processing all financial assistance requests and working closely with donors specifically for financial assistance. Beth played an integral part in the establishment of the food pantry in 1996. Beth took on the additional responsibility of overseeing this department and has carefully helped the pantry grow into a $500K entity. In 2003 she was given additional HR responsibilities and oversight of the front office staff. In 2011 her job responsibility expanded again to include oversight of the Volunteer Services Department and a case manager for families in crisis. Over her 22 year career Beth has seen much change and has been an integral part in the agency’s success. With each new challenge Beth’s positive attitude and willingness to try new things has enabled the agency to work through any barriers and has helped the agency maintain our positive reputation in the community. Cindy Orbach Nimhauser has held multiple local and national leadership positions in a number of internationally known philanthropic organizations. Ms. Nimhauser is currently the Chief Development Officer at Ruth & Norman Rales Jewish Family Services. As a volunteer, she is a Past Chair of the Board of Directors of the Jewish Federation of South Palm Beach County. She was the 2008-2009 Co-Chair of United Jewish Communities – UJC (now JFNA) National Young Leadership Department and Cabinet, and has had the opportunity to travel around the world to witness firsthand the needs that exist. As a speaker and fundraiser, she has raised significant capital for the charities that she has worked with. Ms. Nimhauser was on the Speaker’s Bureau for UJC, training and motivating others to enhance their volunteer experience. Cindy is a graduate of New York University and Hofstra University School of Law, as well as the Wexner Heritage Program, a two year leadership course. Jeff Kurth has held various senior financial positions in the non-profit sector, from Controller to Chief Financial Officer. His experience in non-profit regulatory affairs, external audits, management of financial and IT teams, and budget oversight over a wide spectrum of program budgets make Jeff a key addition to JFS. Jeff received his undergraduate degree in Finance from Northern Illinois University and his MBA from the Keller Graduate School of Management. From the midwest, Jeff is a huge Green Bay Packers fan. Cary Scope earned his Master’s Degree in Social Work from Hunter College School of Social Work in 1995. He worked as a LCSW in New York City for 20 years, gaining experience in the mental health, substance abuse and homelessness fields. He has worked as a clinician, program manager, supervisor, and advocate for well-established agencies including Covenant House, Bellevue Hospital Center, The Bridge Inc., Urban Pathways, and Odyssey House. Since relocating to South Florida in 2010, he has worked as a Quality Reviewer for Magellan Health, a Clinical Director at The Starting Place, Inc., and most recently as a clinician for Aetna Inc., He began working at JFS in the Spring of 2015. Cary lives in Broward County with his wife Lori and son Jackson. Alice graduated from the Carver School of Social Work in Kentucky with a Master’s Degree in Social Work. Her background includes caregiver education & support, senior housing, geriatric assessments, adult day programs and services to individuals with special needs. Alice recently joined the leadership team at Rales JFS after serving at numerous non-profits in the Twin Cities. Shari Cohen was born and raised in New York on Long Island. She graduated from Dowling College with a BA in English/Elementary Education and has a Master Degree in Nonprofit Management from Florida Atlantic University. Shari has worked for more than 20 years in Jewish Community Centers in New York and Florida. Over the years at the Jewish Community Centers, she had many diverse responsibilities as Director of an Early Childhood Center, Camp Director and Children, Family and Teen Director. Her focus has always been on dedicating her career to helping others and making a difference within the community. At JFS, Shari is the VP of Financial Services and Food Programs, overseeing the Financial Assistance Department, the Jacobson Family Food Pantry, Food Pantry Outreach and the Meals on Wheels program. Angelica Sandoval is the Vice President of the Career & Employment Services department at Ruth & Norman Rales Jewish Family Services. She holds a Masters of Science degree in Counseling from Fordham University. Angelica’s experience includes working at a non-profit agency as an Employment Manager for displaced workers affected by “9/11”. In addition, she served as the Employee Assistance Program Counselor for union workers in New York City. Her greatest asset is her ability to identify solutions to problems while empowering clients to affect change in their lives. Angelica loves her work and is motivated by her desire to help people improve the quality of their own lives. As Director of Communications, Jeremy Lurie manages JFS’ strategic marketing, public relations and communications activities. During his 20 plus year career, he has held management positions at Porter Novelli, Zimmerman Advertising, Office Depot and most recently Boca Cosmetics Group. Jeremy is a graduate of Boston University’s School of Management where he received a degree in Business Administration with a concentration in Marketing. Victoria Petruzzo joined JFS in 2011 as the Director of Grants Management. Victoria has over 20 years experience in the nonprofit sector as a development professional specializing in grant writing, foundation and government relations. Through her career, Victoria has held positions at noteworthy nonprofit organizations in New York and Florida including Carnegie Hall, The Jewish Museum, Home Safe, and the Legal Aid Society. She received her Bachelor of Arts degree from Bard College and went on to graduate studies at New York University in Arts Administration. Nadine Greenberg has been in the nonprofit sector for close to 35 years. She began her professional career with the Muscular Dystrophy Association. During the 23 years with the organization she ran offices throughout Florida, coordinated special events for fundraising campaigns, managed medical services programs and worked closely with hundreds of sponsors and volunteers. The past 10 years were spent as Director of Volunteer Services for a large senior living community that included a volunteer corps of over 500. Nadine began her career with JFS in July 2013 as Coordinator of the Feldman Family Diamond and Adventure Clubs and later also included Financial Assistance for the Jacobson Family Food Pantry and Subsidized Home Care. In January 2014, she assumed her role as Director of Volunteer Services for JFS. Jill Waldman is a native Floridian who has spent more than 25 years raising funds through special events for many non-profit organizations throughout her South Florida community. As a development professional, Jill has held positions with many national and local organizations including the Coconut Grove Playhouse, American Red Cross, Pinecrest School, Jewish National Fund and YoungArts. In 2011, she joined JFS as the Director of Special Events. As a volunteer, Jill has shared her love of fundraising with the Foundation for Fighting Blindness, Special Olympics, BBYO and American Expats. Jill is a graduate of Indiana University and spends her free time with her husband and two teenage boys. Howard is a native New Yorker and grew up in Plainview on Long Island. Howard attended the Hebrew Academy of Nassau County from first grade through high school. Howard has a BA in Psychology, MSW and Rabbinical Ordination, all from Yeshiva University. In 1987, Howard and his wife Betsy moved to Israel where all of their children were born. While in Israel, Howard worked in a variety of governmental and private organizations dedicated to helping the elderly. In 1998 Howard and his family returned to the US and came to Boca Raton. Howard began working at JFS in September of 1998. Avital is the Holocaust Survivor Person-Centered, Trauma-Informed (PCTI) care Program Director, responsible for the development and implementation of the PCTI care program at JFS. Avital earned her bachelor degree in Arts in Humanities from Bar Ilan University (Israel) and her Master of Science in Leadership from Nova Southeastern University. Avital is also a Certified Clinical Trauma Professional (CCTP), providing supportive listening and mental health services to local Holocaust survivors. Karry is responsible for all operations of the Jacobson Family Food Pantry. Karry is a native Floridian who grew up in the Miami / Ft. Lauderdale area. She has over 15 yrs of wholesale/retail management experience. Her past positions include Ann Taylor, Pottery Barn and most recently Aldi Grocery Stores.